You’ll find this super simple, incredibly tasty meze (or appetizer) everywhere in Greece. These sweet green peppers fried up to a tender, mouth watering state of delicious will fill your kitchen with the most amazing aromas. Honestly, that’s something I look forward to every time I make these! Pair them with a glass of dry white wine and a big piece of crusty bread for lunch or light dinner. 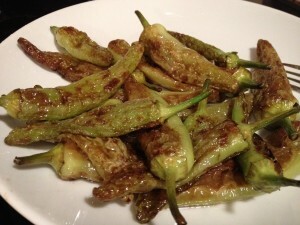 You’ll find that, out of the pan or room temperature, fried sweet green peppers will not disappoint. 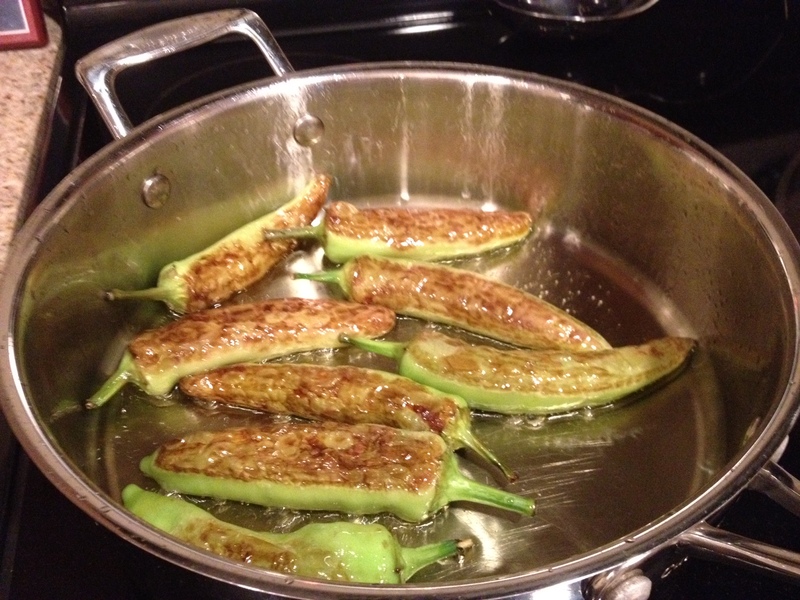 Quick and easy, you’ll need 3 ingredients – sweet green peppers, olive oil and salt. 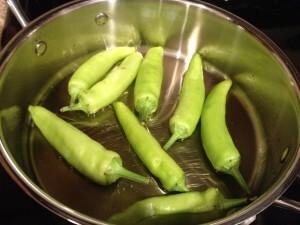 Recipe tip to remember – Poke the Peppers!! Seriously, you must poke each pepper before cooking or they’ll explode in the pan and the results won’t be good. I usually just use a fork to make a few holes in each. And be very careful when frying, these little guys can spit oil everywhere. I like to use my 3 quart saucepan with sides that are higher than a regular frying pan to minimize how much oil gets out. Just a 1/4 cup of oil is more than enough to fry up a pound of peppers. Cook bigger peppers on low-medium heat for 3-4 minutes on each side until peppers are a golden brown and soft. 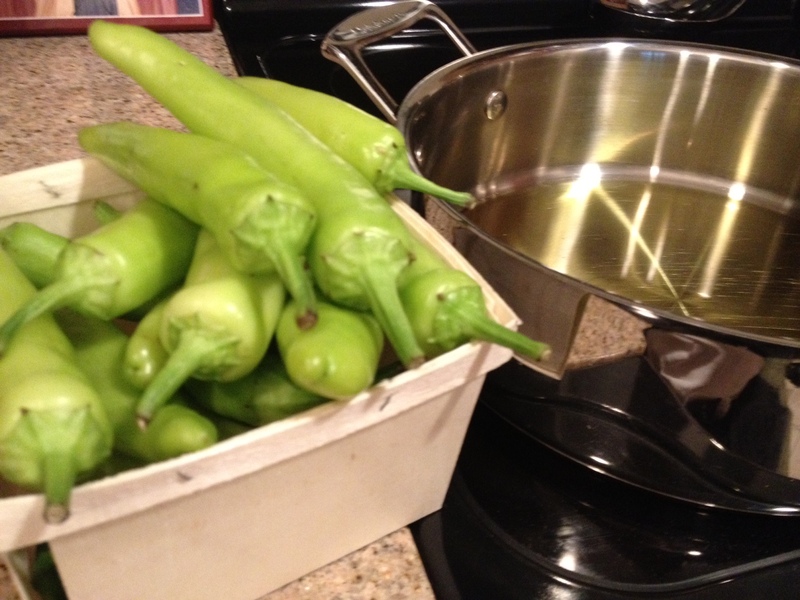 Smaller peppers will take 2-3 minutes per side. 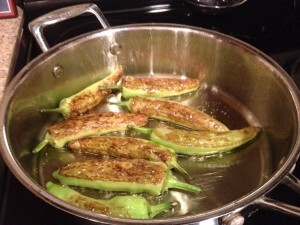 Carefully remove cooked peppers from the pan to a platter. They’ll be soft and can easily split. And so important – Do Not Drain! Make sure not to drain your peppers on paper towel. The oil is so flavorful, you’ll want to save every drop. Lightly salt peppers while they’re still hot. You’ll probably want to let them cool just slightly even though the temptation will be great to take a bite right away! If you make a big batch, store covered in the fridge or better yet store in a glass of olive oil. The peppers will keep for 2-3 weeks and you’ll have delicious pepper flavored oil as a bonus! 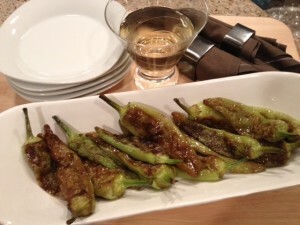 This recipe is great and and the tips works well with other peppers. I know this because I overlooked the word “sweet” in “sweet peppers” for the ingredient list and ended up with very hot peppers instead. I used corn on the cob holders to poke holes in the peppers in advance of cooking and it really worked well. A week later, when I had unexpected guests, I pulled the cooked batch out of the fridge and a few minutes in the toaster oven to heat up and presto… my guests were fed. I will definitely make this recipe again . . .Thanks! Friends here in Greece served these recently. Had to try them myself. Yummy and so easy!